With a typical revenue share model, an OPM provides technology and services to put courses online and attract students and in return for approximately 40-60% of the revenue and a 7 to 10 year commitment. This model has its advantages, especially for universities who have severe financial constraints, no internal resources or expertise to run these courses, or are just getting started in the online world. But as the market matures, more universities seek the fee-for-service model. In a fee-for-service model, the vendor partner provides services and technology needed and is paid for those services as they are consumed. The institution keeps 100% of the revenue and IP and has no long term commitments. This model makes sense for universities who want to build internal competencies and infrastructure — they believe online education has become core to higher education and don’t want to outsource all of it. It also makes sense when an institution wants strong “creative control” of the learner’s experience, and wish to incorporate their institution’s unique pedagogy, student experience or brand (we call this a Custom Learning Experience). They are willing to invest capital, and take on risk, in course development and technology, banking on a strong return on investment since they get to keep 100% of the revenue. They want more control over the marketing and enrollment management processes and approach, wishing to avoid some of the predatory marketing problems that have plagued for-profit institutions the last few years. Many decisions come into play when choosing a partner to put courses or programs online, and fee-for-service versus revenue share is just one. 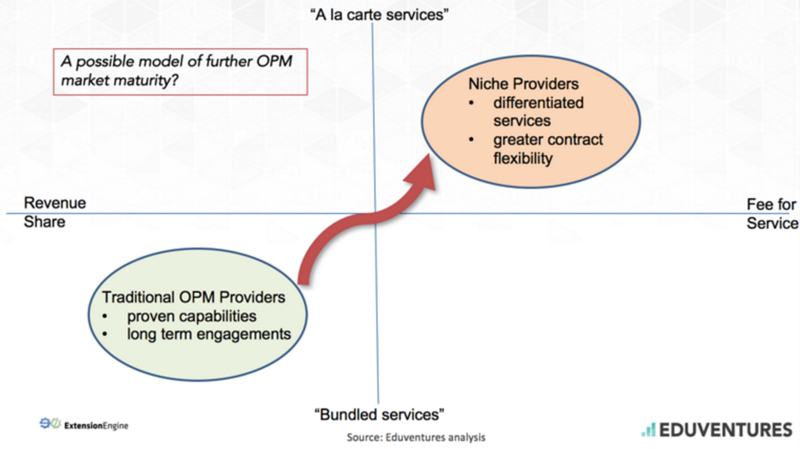 Watch the replay using the link below to get more insight on these choices and you will also gain access to two Eduventures reports at no cost — OPM Market Overview and Top 10 Data Points from 2015.